The element of “play” can be a powerful part of learning. Several weeks ago, my 8th grade algebra students solved radical equations through a Nearpod lesson found here. 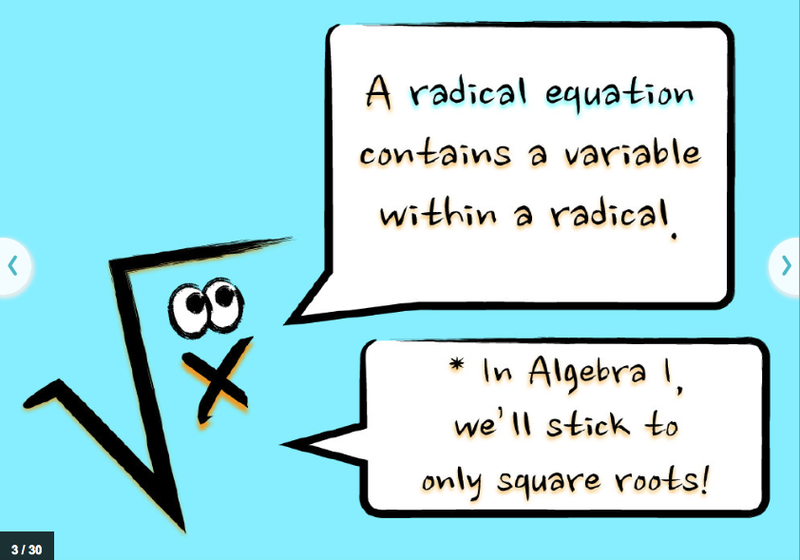 When I designed this NPP (Nearpod Presentation) I created the “radical dude” character using Keynote to reinforce that the independent variable is under the radical symbol. Little did I know he’d get many make-overs during our lesson. Once students understood my lesson pattern (I do… now you do…) the “radical art” ensued. Students swiftly solved each radical equation so that any extra time they had left could be spent embellishing the “radical dude” on the slide. I was in hysterics, and so were they as I “launched” anonymous student work samples to all of their screens. Yes, our priority was the algebra… but the playful cartoons made the lesson truly fun. Enjoy this “radical art” collage, created with Canva. It features some of my favorite radical make-overs. Follow-Up: I displayed this “Radical Art” on the screen at the front of my classroom today. Students went crazy! Immediately, they crowded around the screen to find their included masterpieces. 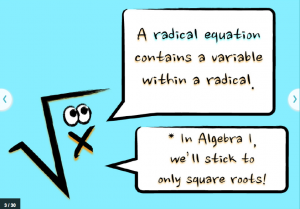 Currently in class, we’re working on a Book Creator project, and one group chose “Solving Radical Equations” as their book topic and wanted to include this art in their eBook. I told them to search for it here, or in my Twitter feed. When I told them they’d been retweeted at least 11 times (at my last glance) and that they went “viral” on Twitter, there was an immediate buzz in the room! 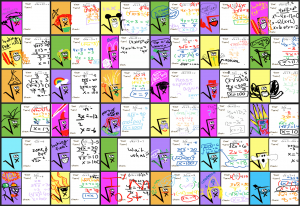 This entry was posted in Algebra 1 and tagged Algebra, app, assessment, Canva, error analysis, formative, Keynote, nearpod. Bookmark the permalink. Our school is a 1-to-1 iPad school and teachers recently switched to Mac’s. I’ve been using the equation editor in PowerPoint but haven’t found a replacement in Keynote yet. How do you create your awesome Keynote presentations with the math symbols? Are you using MathType? You got it – in Keynote, I select Insert–>MathType Equation.